Home » Community » Cookbook Lab » Help! Vegan wannabe overwhelmed with cookbook choices! Help! Vegan wannabe overwhelmed with cookbook choices! Hi y’all, I’m new here and am trying to decide on a few cookbooks, but am so overwhelmed with the choices and all the great reviews I can’t make a decision. I will probably start with 2 cookbooks (I don’t have any; vegan ones that is, I probably have 75 others, or more actually; I love cookbooks). The local library (that closes at 5 pm by the way), does not have any vegan cookbooks at all; actually I have more cookbooks than they do. Anyway, I need one for beginners that has an introduction and explains things to me, (like seitan and tempeh, I don’t know what these are, much less how to cook them). I need meals that are quick to prepare with easy to find ingredients (although on a weekend I wouldn’t mind spending a little extra time in the kitchen if the payoff would be worth it). My meat & tater-lovin husband and two teenage boys might try them, but I will have to fix meat for them in addition, but I would love to be able to find great-tasting vegan food that they could enjoy also and maybe they wouldn't make fun of me. I live in a rural area of East Texas, we don’t have a Whole Foods or a Trader Joes or anything like that. And I would also like one that includes nutritional information for the recipes as I still have 21 pounds to lose and I want to make sure I am staying within my calorie range. Any suggestions, comments and information y’all could provide will be greatly appreciated! I always recommend Veganomicon! It was my first vegan cookbook, and still my fave. Good mix of easier and fancier recipes, different ingredients, good intro. I really like Vegan Vittles. The Pot Roast is amazing. Of the list you have two cookbooks I would choose would be Vegonomicon and Supermarket Vegan or Vegan on the Cheap. For weight loss you might check out "Appetite for Reduction" by one of the writers of Veganomicon. Not on your list is my #1 recommendation for newbies "1000 Vegan Recipes"...she's pretty specific in how to cook the recipes, and they are a lot, seriously a lot, of easily put together and quick recipes. Welcome, stacydan! I applaud your vegan efforts! I really like 1000 Vegan Recipes by Robin Robertson. There's such a wide array of recipes- many of which don't include ingredients that might still be foreign to you- that you can't go wrong (IMHO). I've borrowed 500 Vegan Recipes from the library, and didn't care for it as much. You might want to check out: www.globalvegankitchen.com, Robin's webpage highlighting all of her cookbooks. You can click on the respective book, and follow a link for sample recipes. Robin's written a lot of cookbooks. I've really learned to trust her; I always buy her new books when they come out and have yet to be disappointed. I have to agree with 1000 Vegan Recipes. It's such a great book and is extremely versatile. If I could give three recommendations, they would be Veganomicon, 1,000 Vegan Recipes, and Eat, Drink & Be Vegan. V'Con and 1,000 VR are great for their sheer volume and variety of recipes, both healthy and indulgent. 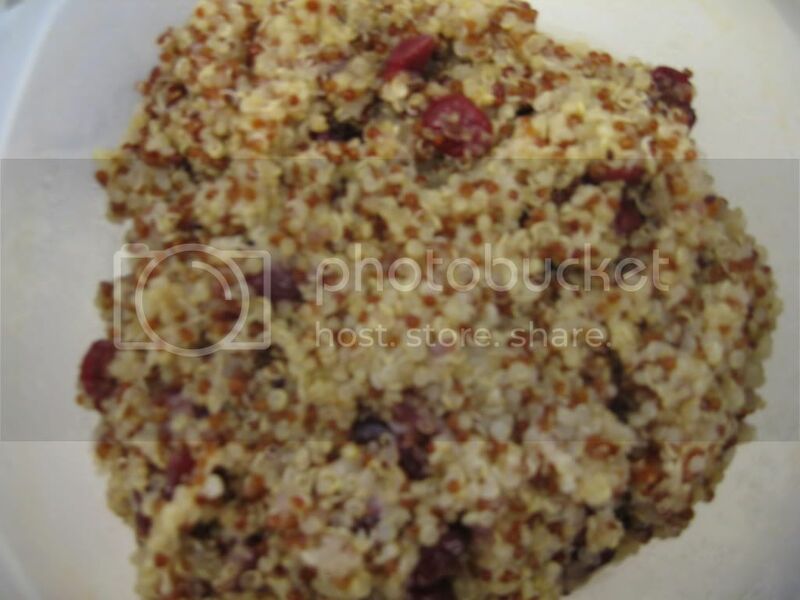 ED&BV is wonderful because Dreena emphasizes healthy but hearty recipes. Her soups are amazing and even her desserts use healthy ingredients. Thank y'all so much for the suggestions! So far I've ordered Radiant Health, Inner Wealth & the 2-week wellness solution which I think is going to be good to start and it had some wonderful sounding recipes, and I think I will get 1,000 Vegan Recipes this weekend, and then for Christmas ask for Veganomicon. And that should keep me busy for awhile! I am so glad I found this site full of knowledgeable and helpful people! I'm sure I'll have lots of questions (you know, is "_____" vegan and things like that) so I'll have to learn my way around this site! Please post your reivews of things you try here. Plus remember we're here for you should you have questions! Well, I have been pouring over the Radiant Health, Inner Wealth and Two-Week Wellness Solution cookbooks and while there are some recipes that are duplicated between the two, I am glad I have both because they are different. One thing I Love about the 2-week wellness solution book is it has a shopping list for each week, along with what to eat each day. The Radiant Health book has some Great sounding recipes and also gives suggestions on what to pair with it (which I need!). And the author has a refreshing sense of humor that shines through. I tried to make the creamy adzuki beans but it didn't quite turn out due to operator error and is not the recipes fault! but it was the first time I had used my pressure cooker (which is an electric digital one) and I didn't know what adzuki beans tasted like and I cooked them too long. I may try these again though and do them on the stove this time because I think these would be good if I hadn't burned them! As far as shiitakes, I like to buy mine frozen at health food stores. They're "Woodstock Farms" brand & are SO good! They're a staple in my house & I order them by the case. If they don't carry them already, many health food stores are willing to order them in. Good luck! Probably any mush room will do as a substitute. I love shitakes and they are super healthy. Thank goodness my mainstream grocery store sells them alongside the other fresh mushrooms. The Asian market also sells them dried, and they are reasy to rehydrate. 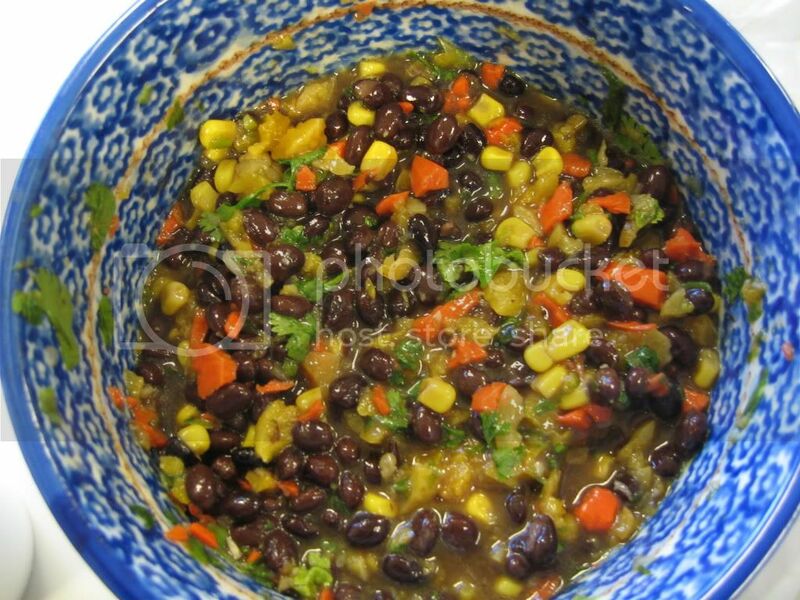 This week I made the Black Bean, Dried Apricot and Cilantro salad, took it to work and had it on top of organic baby spinach leaves, I really liked this and will definitely make it again! My co-workers really liked it also and one even asked for the recipe so I showed her the cookbook and she was impressed and said she wanted to order one also! One night I also made Tess' Happy Salad and it was good, next mine I probably won't put quite as much onion but I loved the artichoke in there! Today I made the Mango Ginger Mint Power Smoothie and it was quite refreshing! It had a little bite to it which I don't know if it was the ginger or the frozen mango, but I since all the fruits I used were frozen, I ended up using a spoon - it was delicious! Tonight I have very good intentions of making Triathon Tostados. I am loving this set of cookbooks! 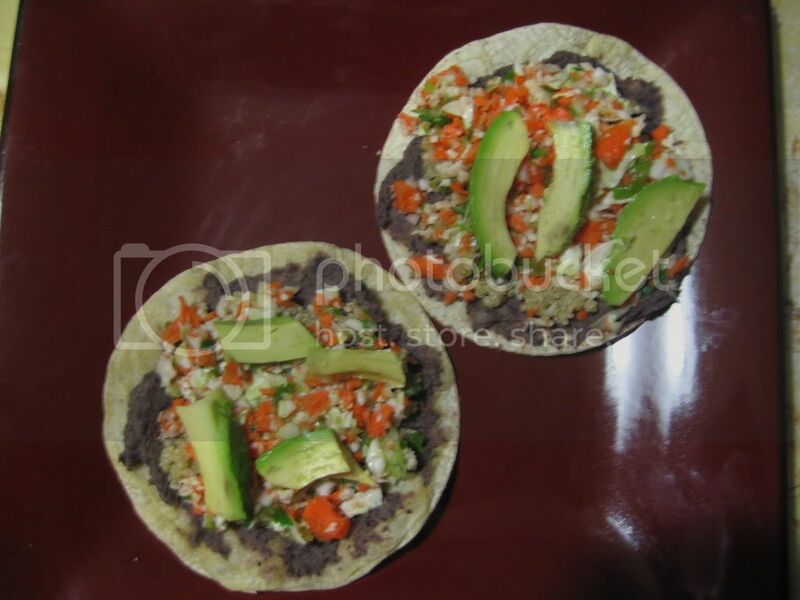 I made the Triathlon Tostados from the Two-Week Wellness Solution - YUMM-O! This was my new favorite dish. VERY good! 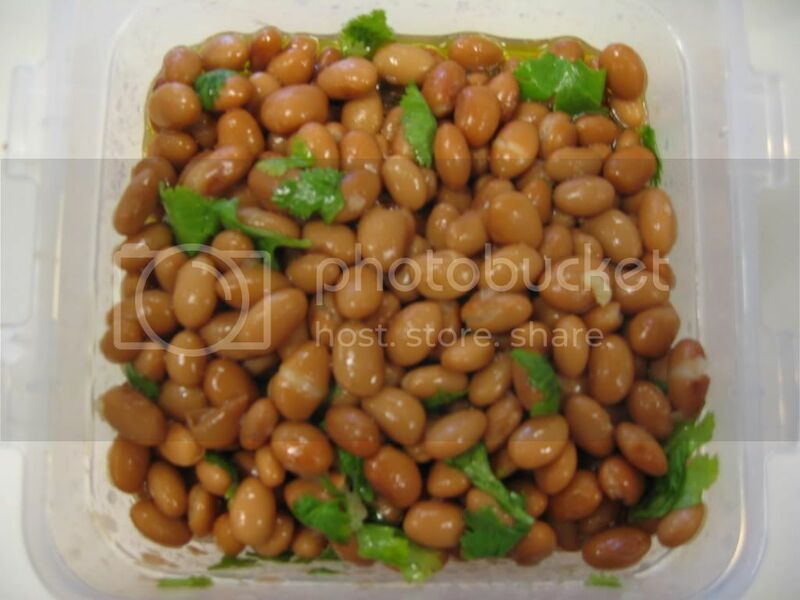 I was actually surprised at the Ful Mudhamas, (I used canned pinto beans), they were delish! That was my new favorite meal. UNTIL I made the Low Fat Lo Mein with the soba noodles. Wow, This dish was amazing! I took it to work for lunch and shared with two of my co-workers (since my family wouldn't touch it - ewww it had vegetables in it ...) anyway, they Loved it also! I finally found shiitake mushrooms (after going to 4 stores), they were fresh. Oh, and I've made Tess' Happy Salad Three times so far - super simple! and I've made the Spinach Quesadilla Several times also - very quick, filling and Delicious!! So tonight I made the Banana Muffins to Write Home About - OMG, these are AMAZING! (I didn't tell my kids they were vegan, although maybe I should have, there would have been more for ME!) My oldest son had 3. Even my husband had one and said it was good! My 15-year old liked them also. I am LOVING this set of cookbooks!! and I'm definitely getting good use out of them! Stacydan- I just have to say... I love your enthusiasm! Also, you are such a talented cook and food photographer. May you continue to experience much joy in your vegan excursions! 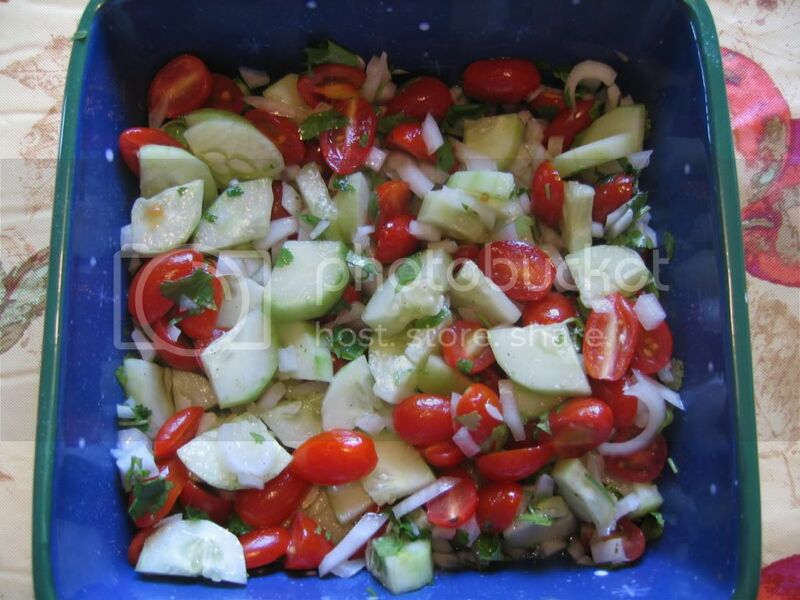 Indian Kuchumber Salad - super easy and very good! Both were quick and easy, two of my favorite combinations, lol! 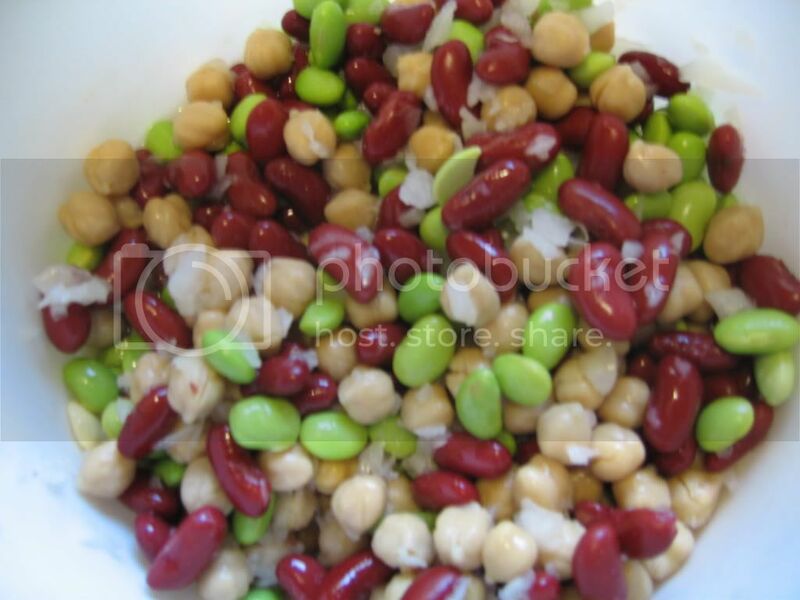 I made the 5 Minute 5 Bean Salad and really liked it. Light and fresh with a touch of sweetness - perfect!